The first German air attack took place in London on the evening of 7 September 1940. Within months, Liverpool, Birmingham, Coventry and other cities were hit too. 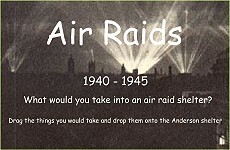 Why were Air Raid Shelters built? People needed to protect themselves from the bombs being dropped by German aircraft. As the night raids became so frequent, many people who were tired of repeatedly interrupting their sleep to go back and forth to the shelters, virtually took up residence in a shelter. These shelters were half buried in the ground with earth heaped on top to protect them from bomb blasts. They were made from six corrugated iron sheets bolted together at the top, with steel plates at either end, and measured 6ft 6in by 4ft 6in (1.95m by 1.35m). The entrance was protected by a steel shield and an earthen blast wall. An Anderson shelter not buried. The government gave out anderson shelters free to people who earned below £5 per week. By September 1939 one and a half million Anderson shelters had been put up in gardens. What were Anderson Shelters like? The Anderson Shelters were dark and damp and people were reluctant to use them at night. In low-lying areas the shelters tended to flood and sleeping was difficult as they did not keep out the sound of the bombings. 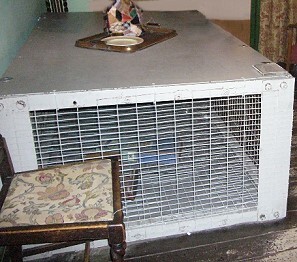 Anderson shelters were given free to poor people. Men who earned more than £5 a week could buy one for £7. When was the Morrison Shelter first introduced? The Morrison Shelter was introduced in March 1941, for people without gardens. 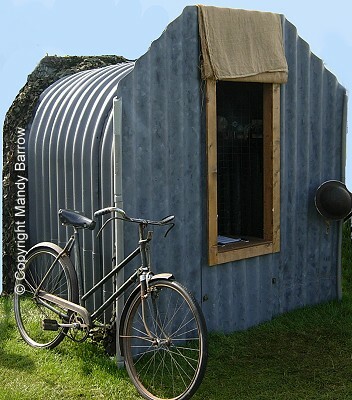 The shelter, made from heavy steel, could also be used as a table. People sheltered underneath it during a raid. The Morrison shelter was named after the Minister for Home Security, Mr. Herbert Morrison. The Morrison shelter was approximately 6 feet 6 inches (2m) long, 4 feet (1.2m) wide and 2 feet 6 inches (0.75m) high. What other places were used as air raid shelters? 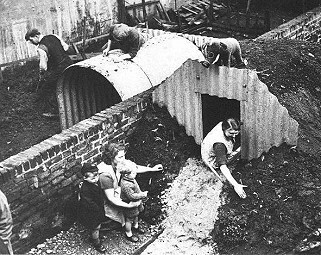 By the autumn of 1940 the government realised that air-raid shelters on the surface did not offer very good protection from high explosive bombs. Deeper shelters were used. Caves were used in many parts of Britain. 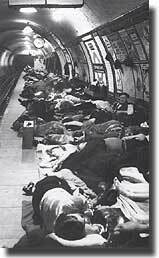 On September 21, 1940 the London Underground started to be used as an air raid shelter. On the busiest night in 1940, 177,000 people slept on platforms. Many bought sandwiches, thermos flasks, pillows and blankets. 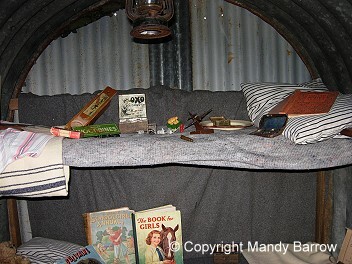 What would you take with you into an air raid shelter?